I am obsessed with these Sausage and Cream Cheese Biscuit Bites. They are ridiculously good. I have made this recipe at least three times this past month. I just can't get enough of them! SO yummy! The sausage and cream cheese mixture can be made ahead of time and refrigerated until you are ready to assemble and bake the biscuit bites. I used Grands! Jr. biscuits - the kind with 10 smaller biscuits in the can. Make sure you buy the smaller biscuits - not the giant Grands!. 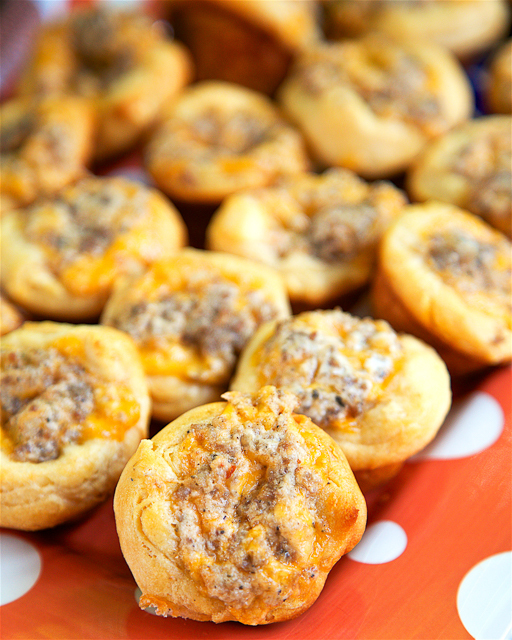 These Sausage and Cream Cheese Biscuit Bites are perfect for tailgating, holiday parties and breakfast! This recipe makes 40 biscuit bites. That sounds like a lot, but there are never any leftovers when I take these to our tailgate!! I tried these just as you have given here and these turned out great. Everyone wanted more and there were NO leftovers....thanks for the great dish. Thinking of adding eggs to the mix and making these for Christmas a breakfast. Sounds yummy! How do I reheat since I had to make ahead of time?!? Do you split the layers for the biscuits are the same circumference or do you split in half...? I am sure that I am over-thinking this!! I want to make them for Easter..sound YUMMY!!! split the layers so instead of one thick biscuit, you have two thinner biscuits. they will be round. Is the muffin tin regular size or for the little ones? Can you freeze these and then reheat them? Denise - I have not made these with puff pasty, so I can say for sure how they will turn out. If you give it a try, let us all know how it worked! Enjoy! 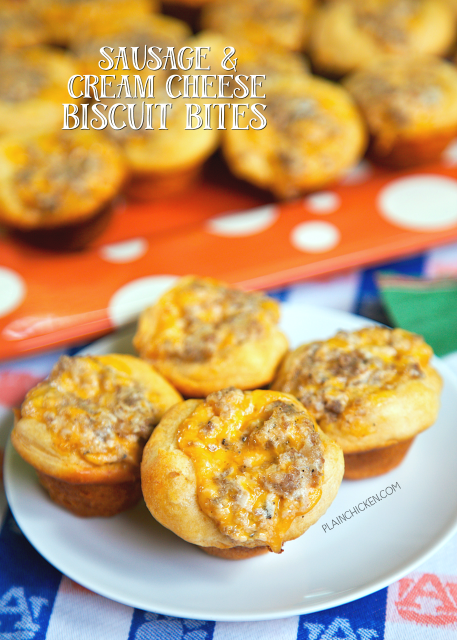 In another of your recipes for Sausage Biscuit Bites, you dont cook the sausage first, you just mix and place in each biscuit cup. Could you use the same ingredients for this recipe, but not cook the sausage and follow the other recipe? Not sure if the cream cheese makes a different. RosieBoo - I've never tried it that way. You can certainly try it. I notice that you have a similar receipe posted using ranch dressing. Which do you prefer? Would you use a whole biscuit for a full size muffin pan? I haven’t tried that, but I assume that would work fine. Enjoy! Awesome! Thank you so much for the quick response! We are making them for breakfast tomorrow morning! Have a blessed Thanksgiving! Yum!!! Wish I were having these tomorrow! Have a wonderful Thanksgiving!! I have frozen biscuits......can I just thaw them and then continue with the original recipe? I’ve never tried this using frozen biscuits. It will definitely change the recipe. You will have to experiment with the baking time. I know frozen biscuits take longer to bake. Thank you, Stephanie, for your prompt reply. Merry Christmas! With regular muffin size, would you use the biscuit whole or still split it? I make them in the mini muffin pan and split the biscuits. You will just need to experiment with the regular pan and see what works best for you. What is the calorie value? Of course I made them, but I'm trying to enter the recipe into the MyfitnessPal app and it's giving me a crazy value!! I don’t have the nutritional information. There are several websites online that you can plug the ingredients into and get it. I don't know what those are...can you name afew? How long in advance can I make and refrigerate the sausage mix before it goes bad? We made them today with regular sized bicuits and muffin tins, and ooooooh so good. It made exactly 20 full size ones! Did u half the biscuit for regular size tin? Are they good at room temperature or do you need to serve them warm? what do you think about using hot sausage? Could these be cooked in the morning and then eaten for lunch for a child at school? I did the math, if you make 40 mini biscuit bites they're 116 calories each. We aren't crazy about creamed cheese could sour cream be used instead? Looking forward to making them for New Years Eve. Thanks for sharing. I'm wondering if bisquick mix instead of a biscuit might work. If I use off brand biscuits regular size how many are in a roll? Basically how many mini muffins should I end up with? ?